An often overlooked aspect to your daily drawing exercise is the warm-up period. Athletes and musician both have standard warm-up activities which they engage in before each performance or practice session, but for some reason this type of thinking isn’t widely circulated among artists. If you struggle to begin a drawing session, don’t like the initial quality of your drawings, or are trying to establish a new Drawing Habit, then warming up is for you! When deciding what sort of warm-up to do, make sure you don’t pick an activity which will take a great deal of effort and time. The point of warming up is to get your body and mind into gear so that you can effectively spend your efforts on a more important piece of work. Make sure that each drawing for your warm-up takes only as much as 2 minutes to complete before moving on to the next. In my suggestions below, several of my activities take under 10 seconds to perform. Fill an entire page with 1 type of drill before moving on to another activity. If you spend your warm-up time rapidly jumping to different exercises, you’ll never truly get the benefit that repetition can give you. Instead, focus on doing 1 drill correctly and resist the temptation to let boredom drive you off too soon. While you certainly don’t have to do that same type of warm-up every day, you should have a small rotation of activities that you come back to frequently which represent your weaknesses. There’s little point in practice if you don’t draw correctly. Very often students fall into the trap of repeatedly drawing the same things over and over in exactly the same way. This is the trap which produces the bulk fan-art websites’ content, and explains how someone can draw voraciously for years without ever improving. 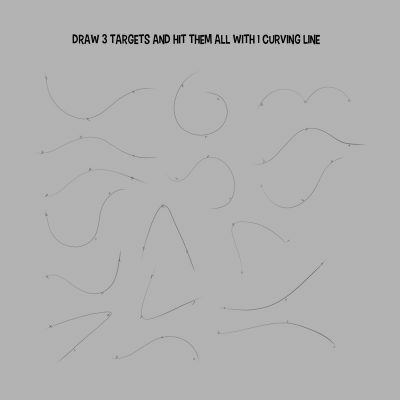 As a rule of thumb, you should be slightly uncomfortable when you practice good drawing technique unless you’ve already mastered it. After all, if you’re not comfortable, then you’re not changing the way you draw, in other words, you aren’t learning! Make sure that your warm-up doesn’t take up all of your drawing time. The point is to get yourself going and to motivate you to begin your drawing session, but the longer your warm-up lasts, the less it functions as a warm-up. You can set a limit by using a timer, or setting yourself a goal of a certain number of drawings, or as I do, set the goal to be filling the page. 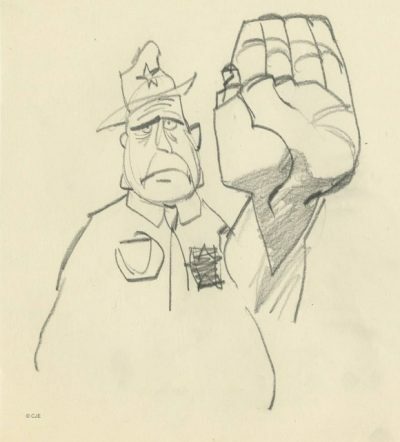 Any finite limit will keep the warm-up short enough to do its job, while still forcing you to move on to your real drawing session once completed. Remember that these are only suggestions, and that your skill level will vary from my own, and that of other artists. Ideally the activity you choose should be some minor but important aspect of your primary focus, and allow you to strengthen your understanding without becoming overly taxing. 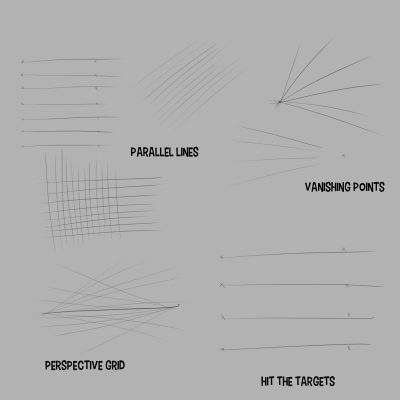 Being able to comfortably free-hand straight lines consistently is a core skill for any artist, but it’s particularly useful if you want to make quick perspective grids for storyboarding. This exercise will help build your confidence while drawing or inking. Make sure that the line is put down only one time, and with a clear, clean stroke. 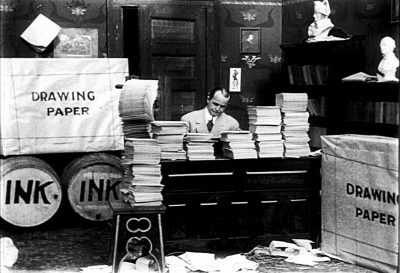 Circles are one of the most fundamental shapes which is used in the construction of characters, scenes and objects. 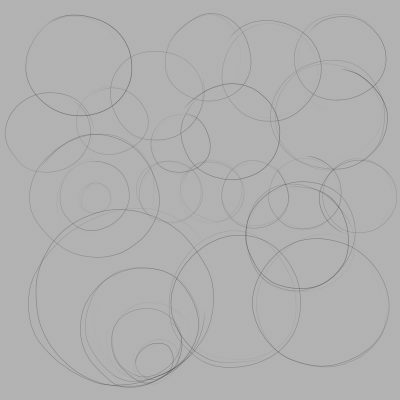 Although you might think you can draw circles already, try to carefully control their size, position, and relationship to other elements on the page. By adding dimension to the circle, we can draw discs in 3D or play with the squash and stretch of a ball while trying to maintain its volume. Be precise and don’t settle for misshapen or crooked ellipses. By adding two ellipses together, you can create a 3D volume. 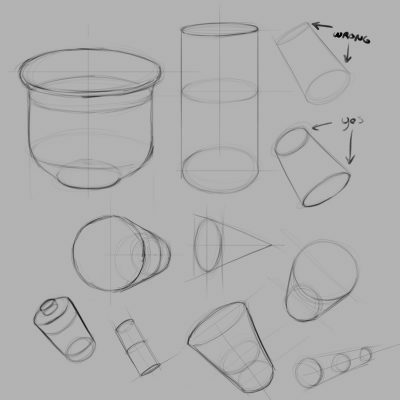 Cylinders are a great way to practice some easy perspective drawing and also to play around with more exaggerated effects like fish-eye distortion. 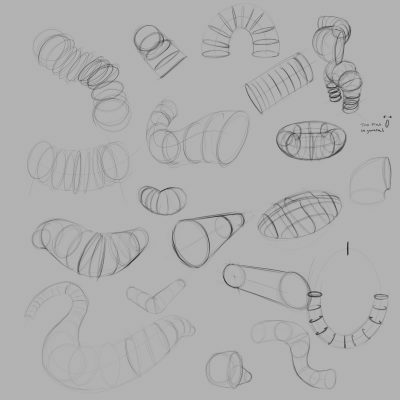 A great way to get a better handle on how ellipses move in space is to make some snake or slinky shaped tubes. This can be a big challenge depending on how you want to manipulate the appearance of depth. 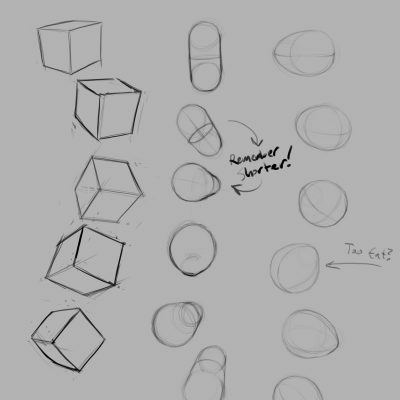 If you’re already comfortable with vanishing points and linear perspective, you could construct some cubic solids on your page in various positions within the same space. 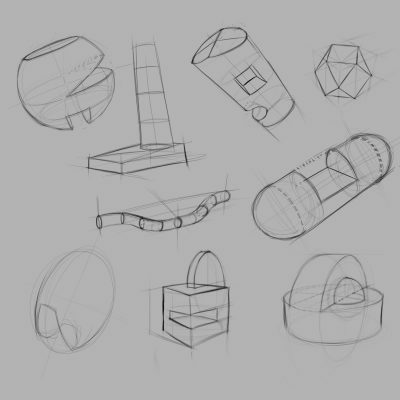 For added challenge try combining complicated volumes like spheres, wedges, cones, etc. 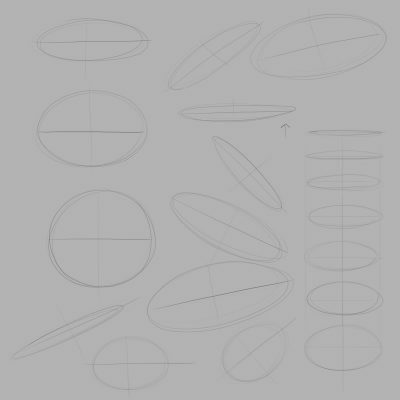 Take any object which you can comfortably draw and rotate it slightly each time you draw it. Make sure that the sequence of your drawings can be viewed almost like a flip-book, or you could always animate the object as your warm-up. 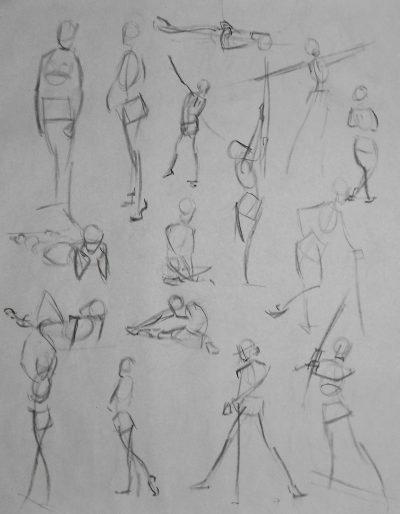 For those who are already fairly accomplished at drawing the human figure, doing simple fast gesture drawings can be a great way to get your arm moving and re-familiarize yourself with the body before you begin a drawing session. In the absence of a live model, there are online resources such as stock photography which you can use. If you want to try random gesture poses at your computer, I recommend quickposes.com. 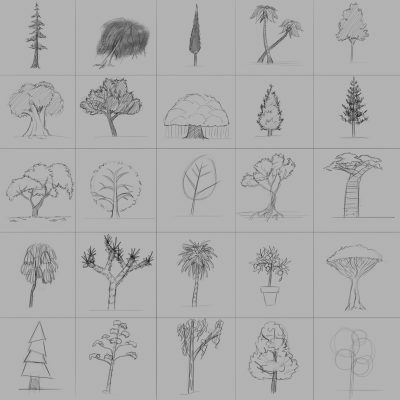 If you aspire to be a concept artist, you may want to try this simple warm-up of drawing 20 variation of any object. This can help you to engage your imagination and test your knowledge of a given subject. For beginners I recommend having an image search handy for reference. This entry was posted on Sunday, July 17th, 2016 at 2:39 PM	and is filed under academic, advice, education, instruction.